Traditional Boats - East and West - at Douglas Brooks Boatbuilding: So what is a sabani? As I have already mentioned, sabani are the traditional small, wooden fishing boats of Okinawa. Ordinary traditional boats in Japan are called wasen, but I've learned from my teacher here that he does not consider sabani a wasen. This reflects at least in part the sense here in Okinawa that this is a different culture from the rest of Japan. It was the Ryukyu Kingdom before being annexed. The photo above is from the cover of KAZI magazine, Japan's largest and oldest boating publication. It shows a medium sized sabani. Sabani were traditionally built in a range of sizes and employed in fishing. They were paddled and sometimes sailed, with a large paddle being used in lieu of a fixed rudder. After the War small engines began to appear and sabani slowly converted over to power, getting ever larger as a result. But by the 1960's wasen-type boats were making inroads among fishermen, first in wood and then in fiberglass. Very quickly sabani began to disappear. What mainly interests me about these boats is their design and construction. Sabani represent an evolution from original dugout canoes to a composite method in which large timbers are fastened together, then carved, then planks added to the structure. This process is not unique to Okinawa; it happened in exactly the same way in the Chesapeake Bay region of the United States, among other places. As the large trees required for dugouts disappeared, boat builders had to adapt and develop more material-efficient means of construction. Perhaps the greatest fascination for me as a boat builder is the fact that sabani builders make these exquisite boats using no nails whatsoever. Instead they use hardwood butterfly keys called locally huundu (note to readers: ANYONE with a theory on the etymology of this word please write me!). I have seen boats built in Japan using these fastenings in just three other places - where they are called by different names - but I have never had the chance to learn how to do it until now. What is becoming clear, just four days into this project, is the degree to which these boats are literally carved into shape. These photos show a small sized sabani that my teacher built. We are building an eight meter boat, medium-sized. 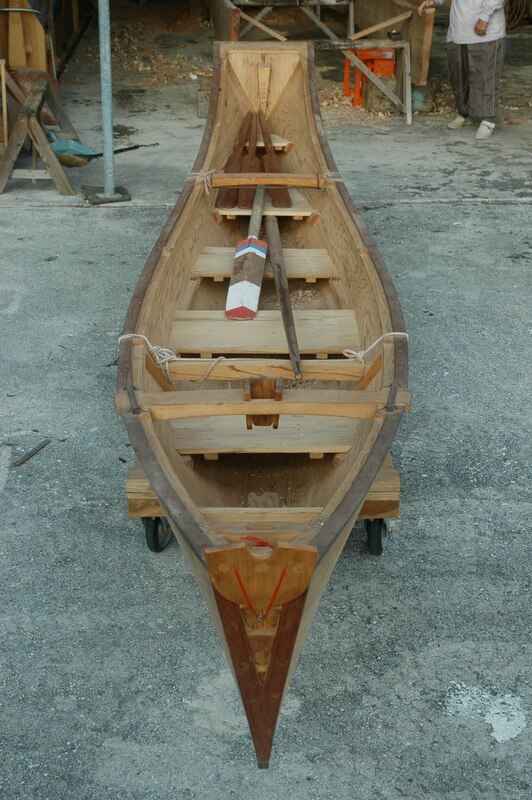 This photo, taken at the bow, shows the keys that join the large timbers of the bottom to the side planks. In between each huundu you can see a single bamboo nail. No doubt the long traditions of carving boats just led to wooden fastenings, skills that amazingly exist (barely) today. Although at times I've been tempted to refer to some special boats as sculpture, nothing really quite approaches these boats for a marriage of aesthetics, engineering and materials. As I share more about my teacher and our work, I will tell you some of the many references that he makes to how these boats evolved in construction. Its all very different and fascinating. Douglas - Excellent and informative posts with quality images. I'm curious what the tools look like that are used to "carve" the timbers once they're fastened together. I am interested in GOBUNUSUMI method. Please take a photo of bottom line. Do you know the historical and functional differences between the Okinawan Yanbaru and Sabani boats?